Art with my needle – my latest creation. It has been a long time and I have almost forgotten how to go about this. Was it one step at a time? Well perhaps yes, but in this case it was one stitch at a time… from an idea racing round in my head. No pattern! 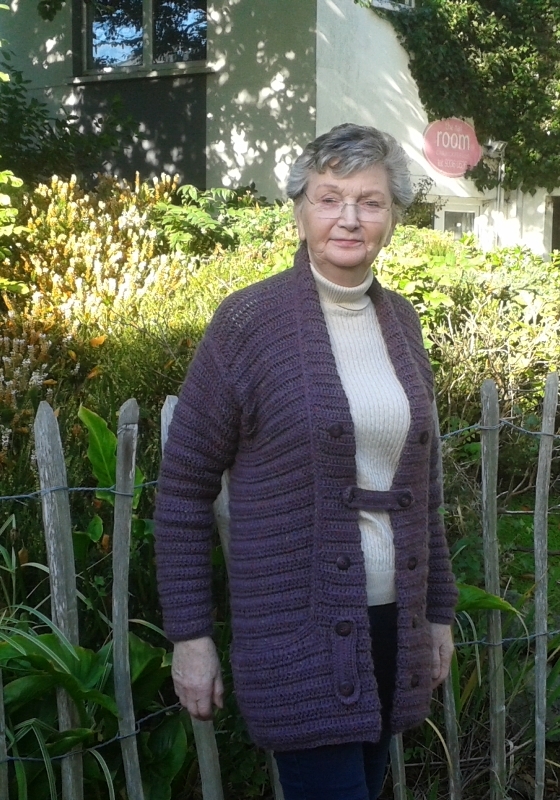 So what elements did I need… a chunky cardigan with a high collar and a pocket for my phone. Could I do that all in one piece? The top piece , all worked as one includes the pockets the shawl collar the two fronts and the back. the sleeves were worked separately. Next was the fun part – fitting all the jigsaw pieces together. Testing it on my dress form, lining the pockets and sewing the pieces together. I wanted buttons down the front with tab closures. Did you notice the difference in the last two photos in the gallery? Four tabs were in place when I left home, but two of them went AWOL! 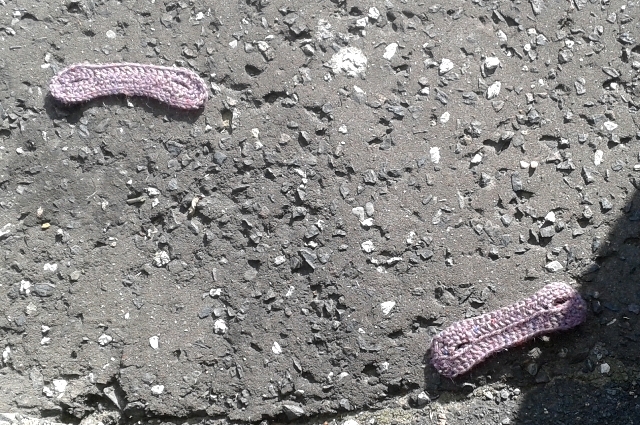 I found them when I came home from Parlour Yarns, they were lying on the pavement enjoying the sunshine, I nearly drove over them! Note to self:- tighten the buttonholes. I have enough for a beret and it is almost finished! I love my Tuesday mornings, kindred spirits working away, sharing knowledge, fun and laughter! This entry was posted in Crafts, Projects and tagged cardigan, Crafts, Crochet, Parlour Yarns on October 14, 2015 by Grannymar. Sally, I have always had the problem of seeing something in 3D inside my head and going straight to make whatever it was, no matter if it was knitting, crochet, sewing or other craft object. Knitting with wire… yes I have tried it! Since this was my first project after the eye surgery and an excuse to keep me away from the laptop, I chose crochet (no dropping stitches) and Aran yarn, it was very soothing to work on. 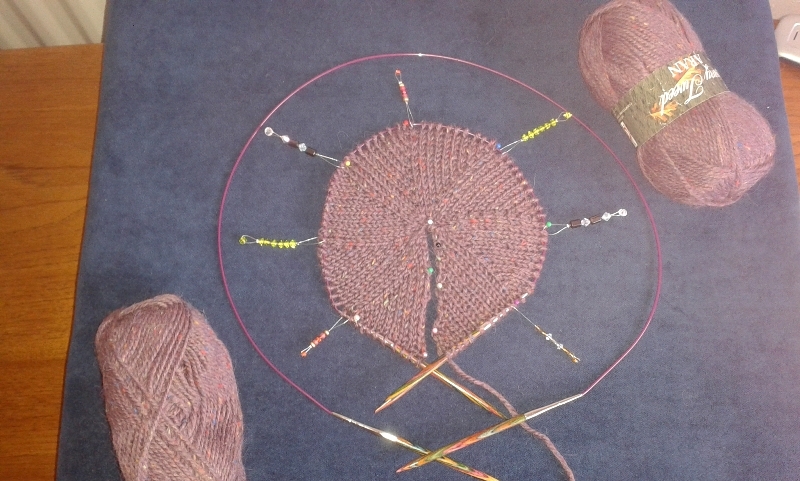 I found it difficult to catch the true colour of the yarn until the very last shot – the beret on the circular needles. And I spy my stitch markers on the beret in progress! You do indeed, Elly. Ello only took one of the eight, so I was one short for the hat. Hint for the future, the magnetic beads (black) can be a bit of a nuisance for working with. Will you be making more….? Sally the beads are stitch or row markers, ideal for use with circular needles and all made by Elly’s fair hands! The beret should have been circular from row one, but as you can see I worked forward and backward and at that point I stitched the sides together and continued in the round. With these markers, I slip them from one needle to the other as I work through the row. I can see what you mean by adding them to the beret. I am half thinking of a tassle with some fine glittery threads and maybe a rose for the side/front?? We will see. And, you are looking good too. I am glad for you to be like that. That cardigan is beautiful Marie. You are one talented lady. Thank you, Maureen. I have several friends who are magic with needles of all kinds and we share and learn from each other. I’m glad you found the tabs! Me too, Nancy, thankfully it was a dry day. It might be back to the drawing board with the tabs. That is a great creation. Your talent is exceeded only by your good looks! It is difficult to get past me Al, I had good training: Four brothers! You are talented as that is a stunning and original jersey. I never learnt how to knit or sew – I thought my mother was just bothering me when she wanted to teach. She is extremely good with her hands and I regret not having learnt. My attempts at both knitting and sewing in school, were a disaster, it was only when I was almost twenty years of age that I began to take any interest. Mammy was not really a ‘needle’ woman but it seems to have come down the line to me from several aunts and grandaunts! That’s a lovely cardigan. And it looks very warm! I love it! Wait until you see my beret!! I love the tab closure – actually I love it all, beautiful design. Like you, I never use a pattern. Really, really suits you. I feel good in it and it will be very cosy as the temps drop. I am still fiddling with the beret, but nearly there. Such a beautiful cardigan! It looks warm, too. Yes it is very warm and will get plenty of wear in the next weeks and months. Wanted to check how you are – I hope everything is fine, Marie. Great work that you have done with the cardigan. Looks nice. And the beret? Is it already finished? I look forward to seeing it. BTW you’re looking great! I’m glad you recovered so well. Irmi, I am well and busy ‘running the roads’ – I am making up for lost time and enjoying my outings and driving. The beret is finished and has been worn. As a result I was asked to make two more, one for Elly and the other for the girl who gifted that Yarn. Another six rows and the third will be finished. I will photograph them before Wednesday and post photos. Hope all is well in your world. I really need to get myself in gear and begin regular blogging again. Thanks for checking up on me. So you’re always busy in realising such nice errands, arent’t you? And you are industrious, too! – With me that you’re asking: Well, it’s kinda ok. Being unemployed for a quite a long time now makes me not always feel quite well, especially the thoughts of my future make me “blue” from time to time. – Sorry for coming by just now and then… Hugs!